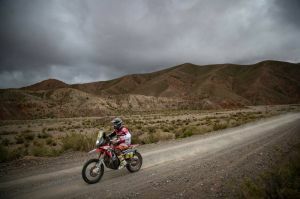 The Dakar Rally, en route through Bolivia, is taking a bad beating from the weather. The country, which has been suffering an extreme drought for several months, has seen the arrival of the race coincide with arrival of the rain. The heavy downpours, while good for local irrigation, are causing more than a few headaches for the national road system. Stage 6 from Oruro to La Paz with 527 kilometres of timed special stage, was set to be the longest of the twelve Dakar stages to be raced against the clock. Now, the stage scheduled from Uyuni and Salta, with 492 kilometres of special, will be the most lengthy in the Dakar 2017. Today the riders, assistance and crew of the Monster Energy Honda Team will make the liaison by road to the La Paz bivouac. Tomorrow the team will get to savour a well-earned day off in the Bolivian capital and set about preparations for the following day. As a logical consequence the race order remains the same as yesterday’s bar any minor modifications.